Mac OS X 10.7 “Lion” was released yesterday (read my review of it at The Guardian), and one of the standard apps that has been most significantly updated is Mail. Besides the visual overhaul, Mail also now supports a feature I’ve always enjoyed in Outlook: multiple different colours of flag with which to mark a message for follow-up. There are seven colours, and by default the flags are simply named after the colours (Red, Orange, etc). I prefer my flags to have more useful names, and thankfully you can change them. This brief article explains how. You can set a flag (only one per message) when there’s a message selected in the message list. Simply choose a flag from the flag popup-menu in the toolbar (or from the Flag submenu of the Message menu on the main menubar), and your flag is applied. To change the name of a flag, you first have to apply it to at least one message. The reason is that doing so causes a “Flagged” section to be visible in the Reminders area of the mailboxes list (you may have to show the mailboxes list too). 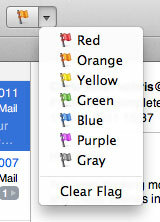 You’ll see a smart mailbox named after each flag, which contains any suitably flagged messages. Like most other mailboxes, these smart mailboxes can be renamed. 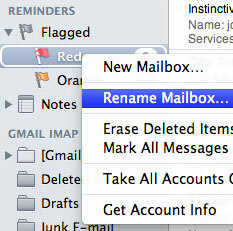 Just right-click on the one you want to rename, and choose “Rename Mailbox…” from the contextual menu. Type the new name, and press Return. Repeat the process for any other flags you’ve used, and you now have much more useful flag names. 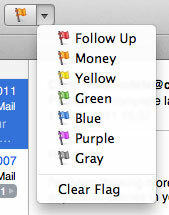 The new names are remembered between launches of Mail, and also appear in the flag popup-menu on the toolbar, and in the Flag submenu of the Message menu.